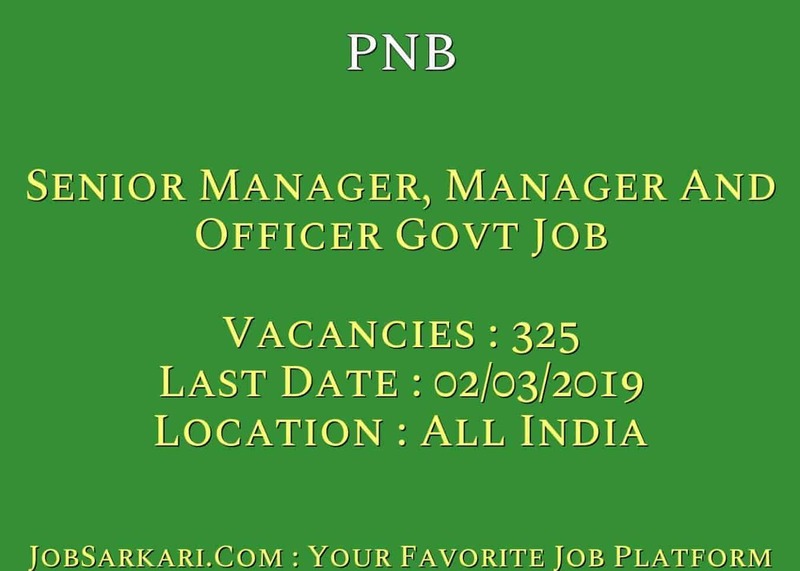 PNB Senior Manager, Manager And Officer Govt Job 2019 Result Check Here. PNB Senior Manager, Manager And Officer Govt Job 2019 Interview Letter. PNB Senior Manager, Manager And Officer Admit Card Check Here. PNB Notification is out. PNB is recruiting for 325 Senior Manager, Manager And Officer 2019 Interview Letter Posts. You can check PNB - Punjab National Bank last date, download PNB notification, visit PNB official website and check other PNB Vacancy details.Complete Vacancy and recruitment Details about 325 Senior Manager, Manager And Officer 2019 Interview Letter vacancies in PNB are provided below by JobSarkari.Com only for you. Last Date of Apply Online. 02/03/2019. Date of Admit Card 08/03/2019. Date of Online Examination. 24/03/2019. Total No. of Post 325. Senior Manager (Credit) Candidate Must Have Passed CA/ICWA/MBA or PGDM (with Specialization in Finance) or Equivalent Post Graduation Degree/Diploma From any AICTE Approved Institute And Having Minimum 05 Years Post Qualification Experience in Bank/PSU/Corporate High Value Credit/NBFC. 25 to 37 Years. Manager (Credit) Candidate Must Have Passed CA/ICWA/MBA or PGDM (with Specialization in Finance) or Equivalent Post Graduation Degree/Diploma From any AICTE Approved Institute And Having Minimum 03 Years Post Qualification Experience in Bank/PSU/Corporate High Value Credit/NBFC. 25 to 35 Years. Senior Manager (Law) Candidate Must Have Passed Graduation with a Degree in Law Graduate Who Has Passed 05 Years Integrated Course and Having Minimum 07 Years Experience Active as Practicing Advocate or As Low Officer in the Legal Department of Scheduled Commercial Bank/State or Centerl Govt./PSU. 28 to 35 Years. Manager (Law) Candidate Must Have Passed Graduation with a Degree in Law Graduate Who Has Passed 05 Years Integrated Course and Having Minimum 03 Years Experience Active as Practicing Advocate or As Low Officer in the Legal Department of Scheduled Commercial Bank/State or Centerl Govt./PSU. 25 to 32 Years. Manager (HRD) Candidate Must Have Passed 02 Years Full Time Post Graduate Degree/Diploma in Personnel Management/ Industrial Relations/HR/HRD/HRM/ Labour Law and Having Minimum 03 Years Experience as Officer, in the Field of HR in Scheduled Commercial Bank/PSUs/ Central or State Govt. Department/ Listed Corporate Entity. 25 to 35 Years. Officer (IT) Candidate Must Have Passed MCA/ B.E./ B.Tech Degree in Electronics and Communication/ Computer Science/ Computer Science & Engineering/ Computer Science & Technology/Information Technology and Having Minimum 01 Years Experience as on Date of Application in Software Development/ Handling and Maintaining of Database / Networking / Cyber Security/ Data Analytics. 21 to 28 Years. 2. Interview / Group Discussion. 3. Candidate Need to Fill All the Mandatory Details in the Application Form. 6.Online Application Can be Submitted on or Before 02nd March 2019. Q. What is the Last Date For PNB Senior Manager, Manager And Officer 2019 Interview Letter Vacancy ? A. 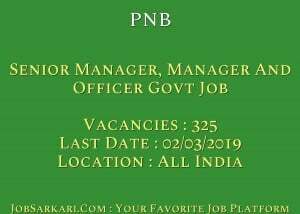 Last Date for PNB Senior Manager, Manager And Officer 2019 Interview Letter Posts is 02/03/2019. Q. What is the Form Type of PNB Senior Manager, Manager And Officer 2019 Interview Letter Recruitment ? A. The Form Type for PNB Senior Manager, Manager And Officer 2019 Interview Letter Posts is Online. Q. How many vacancies are available in Punjab National Bank Senior Manager, Manager And Officer 2019 Interview Letter Posts ? A. There are about 325 Vacancies in Punjab National Bank Senior Manager, Manager And Officer 2019 Interview Letter Posts. Q. What is the Full Form of PNB ? A. Full Form of PNB is Punjab National Bank .